I never thought I could have a thing for notebooks, but when I was in LA, my friend Silviya gave me the loveliest of Japanese notebooks that I instantly developed a crush on. It has a stylish mustard yellow canvas cover and it makes me want to nicely write out my musings (instead of scribbling them on a napkin). The cover is bonded with starched, pressed water-resistant cotton. The pin-graph paper is ecologically made and chlorine free. 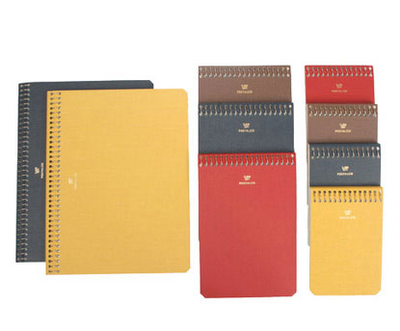 Each notebook is subtly adorned with the postalco logo: a stylized carrier pigeon. Want one of these simple pretties too? You can find them online at Kaufmann Mercantile.